Purifies your skin & lets it breathe again. For a healthy-looking, bright complexion. Living an active and full life can take its toll on your skin and lead to a dull, grey complexion. To maintain your skin's radiant complexion, daily cleansing is essential. 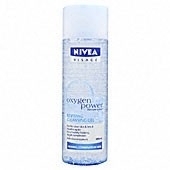 Nivea Visage® Oxygen Power® Cleansing Gel revives your skin letting it breathe again. How does Nivea Visage Oxygen Power Cleansing Gel work? - The refreshing, crystal clear cleansing gel with soft cleansing pearls deeply purifies, gently foaming without drying out the skin. When I purchased the oxygen cream from this range I also purchased this gel cleanser as I like to stick with the complete range for my skincare routine. The gel based cleanser promises to cleanse your skin without drying and to prepare you skin for the cream application. The bottle is clear and attractive and the gel itself is a light blue colour with a suspension of cleansing beads inside. The dispensing of these beads each time is a little erratic at best and sometimes you get none from the bottle at all. I think these are more for look than practicality as far as I could tell as the cleanser gives the same results with or without them present. There is a pleasant refreshing scent to this gel and you only need a small amount to lather beautifully on the skin. It does not irritate or sting your eyes and des remove dirt effectively. This is not sufficient for removing stubborn makeup however. Although my skin felt refreshed after rinsing this cleanser did leave my skin feeling a little tight but this was rectified by the cream. I did not see a vast improvement in my skin during the use of this cleanser but if you prefer to wash your face instead of using a cream cleanser this does a sufficient job. Nice bottle easy to use. A wonderful easy to use cleansing gel that foams up and cleanses deep down into the skin. Skin feels so clean and refreshed, perfect for summer especially when it is warm and your make up clings on. Cleanses all impurities from the skin. After a few weeks of use, skin looks healthier, brighter and wonderful. "When I purchased the oxygen cream from this range I also purchased this gel cleanser as I like to stick with the complete range for..."